Tiny, swift, and iridescent, hummingbirds dart around flowers and feeders, sipping nectar with their seemingly delicate beaks. But new research shows that these beaks actually double as deft, dagger-like weapons that male hummingbirds use when fighting to stab at their opponents' throats. The discovery is the first evidence of weapons in male bills, and has big implications for understanding the evolution of these – and other – angry birds. "Historically, bird beaks have been the prime example of adaptation through natural selection, such as in the textbook example of Darwin's finches," says Alejandro Rico-Guevara, research associate in the Department of Ecology and Evolutionary Biology and lead researcher on the study. "But we show here the first evidence that bills are also being shaped by sexual selection through male-male combat," he says. "It is exciting to think of all these forces working on the way animals look, and to think about how they might affect males and females differently." 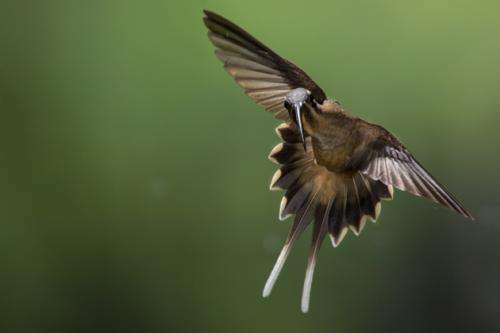 The study, recently published in Behavioral Ecology, focuses on the long-billed hermit, a tropical hummingbird, in its native Costa Rica. Mating rituals in this bird involve leks, where large groups of males defend space in which to mate with females. "Once a female is in a territory, the male will court her with elaborate displays and songs. So in these species the males are constantly fighting to maintain the best territories," explains Rico-Guevara. Scientists have known that males and females of this species have differently-shaped beaks, but prior explanations chalked up this dissimilarity to their feeding habits. "The previous explanation of ecological causation suggested that males and females had different bill shapes because they fed on different flowers, perhaps to minimize competition between the sexes," said Rico-Guevara. But Rico-Guevara observed that adult male hummingbirds used their bills extensively during fights, and he wondered whether their differently shaped beaks conferred an advantage. So with study coauthor Marcelo Araya-Salas, a Ph.D. candidate at New Mexico State University, he measured the size and puncture capability of beak tips in juvenile and adult hummingbirds. The researchers found that during the birds' transition to adulthood – puberty, if you will – males developed elongated beak tips that were sharper than those of females. They also observed male birds using their bills to stab one another in the throat during fights, and found that, not surprisingly, males with longer, pointier bills were more likely to win these battles and therefore defend the best territories. Rico-Guevara suggests a new way of looking at evolution in these bills: instead of birds evolving beaks that fit into the flowers they frequent, perhaps the flowers have evolved a particular shape to conform to the longer, pointier beaks that males use during fighting. He has also observed weaponry in other species of hummingbirds, and has plans for more studies to learn more about the evolution of these birds. In particular, he hopes people realize that despite their tininess, hummingbirds are strong and aggressive animals. "I think people initially think of them as beautiful, delicate creatures," he says, "but I enjoy revealing their pugnacious attitudes." Funding for this research was provided in part by the National Science Foundation and the National Geographic Society.